Uptown Smile: iTero Technology now at Uptown Smile. iTero Technology now at Uptown Smile. At Uptown Smile we strive to be on top of new technology that can provide our patients more comfortability and a better overall service during their visits. One of our most recent product purchases does just that. The iTero Intra Oral Digital Scanner. 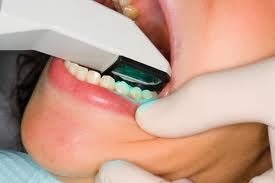 This new device allows us to scan your teeth with great accuracy and eliminates having to make goopy impressions of your teeth. This means much less discomfort to you! Precision Scanning: iTero technology captures whole-tooth images without data sampling for precise scans. This allows for more accurate restorations and virtually eliminates remakes to less than 0.5% and for those restorations to seat more easily. We hope that you find this information helpful. You may contact us to make an appointment for restoration or Invisalign Treatment at (612) 822-1484.